Buy 1 oz Sunshine Mint Morgan Silver Rounds | ?? 1盎司阳光铸币厂摩根银圆 A beautiful historic design now available at bullion round pricing! 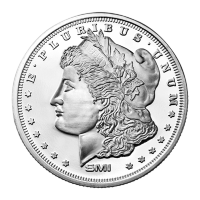 This round is based on the design for what became known as the Morgan Dollar. George T. Morgan, an assistant engraver at the Philadelphia Mint produced the winning design for the dollar, hence it is referred to by his name. Anna Willess Williams modeled for Morgan as Lady Liberty. He said that her profile was the most perfect he had ever seen. The Morgan silver dollar was minted from 1878 to 1904, with a one year return to production in 1921. The original Morgan dollars were produced with ninety percent silver and ten percent copper in order to conform with the coinage act of 1837. This round is 999 pure silver. The obverse has a left facing profile of Lady Liberty and the words "E Pluribus Unum" and the SMI logo. The reverse features a Bald Eagle with wings spread clutching an olive branch and several arrows as well as the Sunshine Mint's mintmark security feature. The middle of the SMI "Mint Mark SI" security feature is not visible to the naked eye, although when viewed through a unique decoding lens, the security feature becomes visible. 1 oz Sunshine Mint Morgan Silver Rounds are an excellent way to invest in pure silver because their premium above the silver spot price is less than that of legal tender coins.